Imagine with me. Take the wonders of Zelda. Mix in a handful of nostalgia that smacks of The Princess Bride (think: sweet ole Gramps, reading to you, late into the night; safe, in front of a crackling fire), a dab of Mario – maybe, even, a sprinkle of Skyrim (Yes. I said it. Bear with me, before you panic). Bake at 350° F for 45 minutes, and let cool. That's the recipe for Blossom Tales: The Sleeping King, a top-down, A-RPG set in a whimsical world full of wonder. For those of you who are impatient and want to skip to the verdict: buy this game. A final word for the impatient that choose not to read the whole review: Ignore the chatter about "Zelda. " Yes, it was a great franchise. 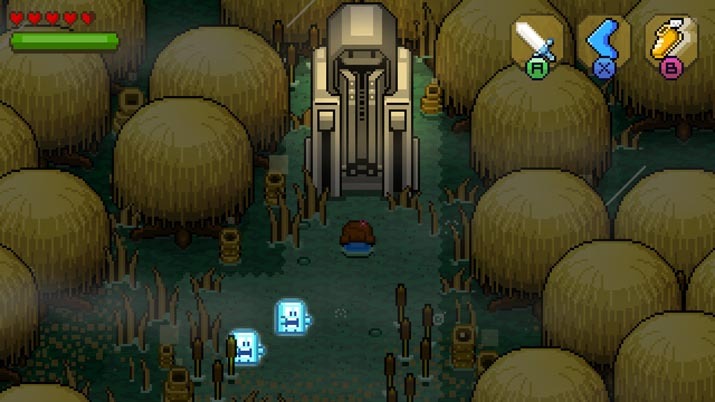 And, yes, Blossom Tales comes across in a similar manner, but unapologetically so – Gramps even gives Hyrule a shout-out in the opening scenes. 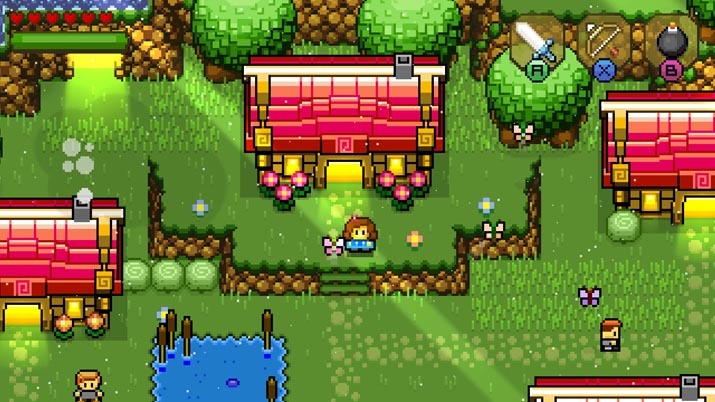 So, whether you loved or hated those games, or never even heard of those games, Blossom Tales deserves a nod as a fantastical diversion, all on its own. 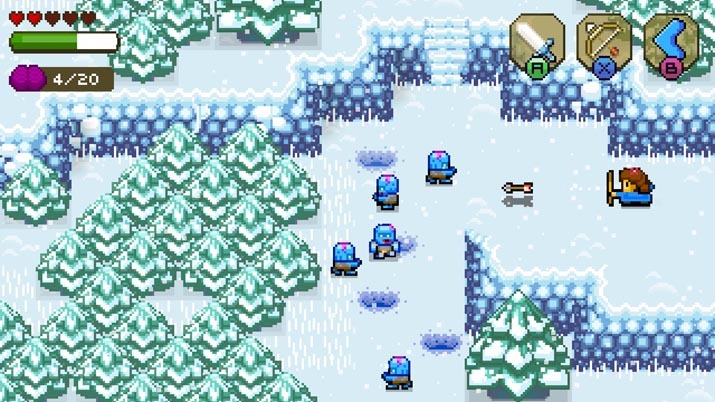 I have not been a huge fan of 2D games since the 1990s (maybe I have become a bit of a snob in my old age), but what used to seem so magical (like Mario, on the NES) now seems… well, old. But within the first few minutes of playing this digital confection of a release, all prejudices toward 2D games were forgotten. When you begin playing Blossom Tales: The Sleeping King, you are introduced to Grandpa. No spoken words here – you get to read this game – and to be quite honest, there were times I experienced the same emotions I feel when I completely lose myself in a good book. The dialogue between Grandpa, Lily (the namesake of the heroine in this tale) and Chrys is fun, at times LOL-ably so. Jokes, sass, and excitement abound. At the end of one critical part of the story, I found that I was holding my breath alongside Lily and Chrys, in fear that the worst was about to happen, and that I’d be left hanging until a sequel is released. And I do hope there is one; after all, Chrys deserves his story! But I digress; can you tell that this title got to me? Blossom Tales: The Sleeping King begins with a lovely bedtime story, being told to the kids, Lily and Chrys. Shortly after the game opens, I realize I’m attached to the sassy little buggers, so it's a bit sad to discover they are only narrating, not actively participating - unless you count the battle between Lily and Chrys as to whether a particular boss is a Pirate Queen, or a Ninja Lord (Spoiler: You get to choose). Worry not; the 'voices' of Grandpa, Lily, and Chrys accompany you throughout. At some points, I felt as if they were playing the game, and I was but turning pages. But, this isn't to say the action is lacking. Want to climb rocks and cut down butterflies? Go for it. An open world awaits you. An open world that is very combat-oriented, that is. What I thought was a boss was just a standard, run-of-the-mill baddie. Golems, fairies, witches - dragonsorcsevilbrothercrazybirds - it’s all here. While some rooms may seem a bit crowded, they are all entertaining and fun, and that's what gaming is ultimately about; the freedom to escape into a different (sometimes better) world. Lily is the heroine, the unlikely hero(ine) that appears in most good fantasy and fairy tales, that has to save the world. Or, at the very least, the Sleeping King. I won’t ruin the surprise, someone the beloved King trusts is acting dastardly; as the King snoozes, evil brews. You will work your way through a myriad of landscapes: several villages, at least four dungeons, stagnant swamps, desolate wastelands, pastoral farmlands, and more. (Note: the ice is very slippery). Even though it’s very combat oriented, the only “limit” to the ammunition Lily has is an endurance meter. Other than that? Fire at will. Bows and arrows, a sword, explosives and elemental attacks: it’s all here. And you don’t run out! Potions are a bit of a different story, so don’t go nuts like I did, and use them all too quickly. There are villagers to trade with, many side quests are available (hence the Skyrim reference - I lost myself in the game for an embarrassing amount of time searching for a jar of mushroom soup). However, the lack of an easy way to keep all your side quests straight is noticeable; I just expected to be able to pop open that quest list and have it all laid out. Not so. This feature would be, of course, a nod to the good old days of Nintendo. However, they have done such a good job developing this gem to feel modern that credit is due. 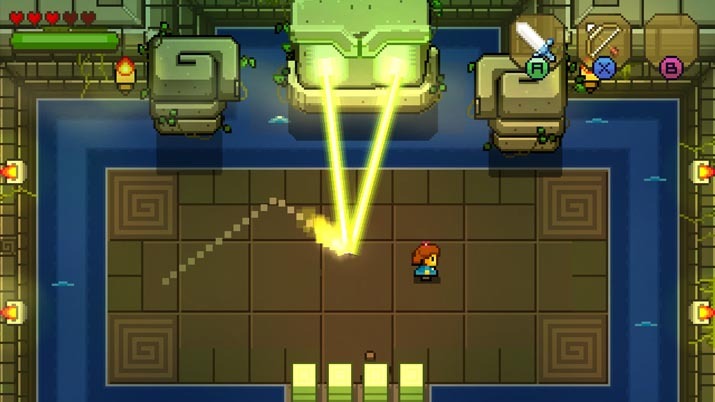 Blossom Tales provides something for everyone. Don’t want to fight any more orcs? It’s cool. You can focus on the puzzles. Lots of puzzles. Most are relatively simple – walk through a pattern of tiles on the floor, only touching each tile once; slide blocks to cover other tiles – and while there is no clear description of what to do, it’s fairly easy to figure out what needs to happen. Fair warning: even though most puzzles only gave my impatient brain a tinge of annoyance at most, there were a few that induced profanity, and self-imposed timeouts. Also, there are so many hidden areas here that there's no need to be dungeon crawling the whole time. Watch for: cracked walls (hit ‘em with a bomb), shadows on the ground (when you have your shovel give ‘em a dig), and items you can drag. I spent hours roaming around the world, finding treasure and helping those in need. Cutting the grass and blowing up headstones, I felt like a veritable Robin Hood. The only qualms I have with this release are due to my incredibly embarrassing lack of patience, and a deeply rooted penchant to negativity. I won’t harp on a couple of the puzzles that were so difficult I may have had to call in a pinch hitter (No, not the eight-year-old, though she has claimed the game once I finish it). Also, there were a couple of grammatical errors; not a big deal, but when reading is a large part of your game, it can be a little distracting, especially if you have a psycho-obsessive brain like mine. The Boss fights, however, could be improved. A life meter would have been fantastic. Yes; the bosses will flash green, then yellow, then red, however that’s not the most helpful gauge in the world when trying to decide if you want to rely on a resurrection flower or take a chance with a health potion.